Introduce some bright and cheerful ambiance to any area of your home with Mexican tiles in "Abasolo" style. 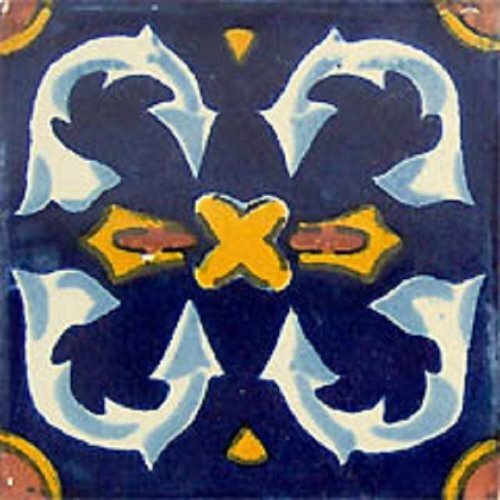 This hand painted and unique tile in dark blue, yellow and terracotta over white background will make a great stand in a kitchen or a rustic bathroom. Use them as main design pattern or to add some Mexican accent into the renovated space. I thought installing in my kitchen plain cobalt tiles would make the wall dark so decided to get some accent tiles. Since this pattern has the same color as background as the rest of filed tiles, the choice was obvious. Our tile setter laid them one per six filed tiles crating interesting mosaic. Also, the last raw of tiles finishing the wall at the top has a border made of the same design tiles. Mixing both dark blue tiles with Mexican tile style pattern made our kitchen quite Mexican looking. It was our intention right from the beginning when we decided to renovate our kitchen. Shipping takes time, tiles come from Mexico what may add some extra time to delivery. I ordered Abasolo tiles and hand painted tiles with the same dark blue color. I like how the tiles were made and the design is nice. Even though that I live in Israel I was expecting to receive my tiles much sooner. They argument was the tiles were shipped from Mexico to the US and then to me what took longer than usual. Beside this little inconvenience I am satisfied from the transaction and like my Mexican tiles on my kitchen wall. My tiles were delivered on time and they were packed very well. Even though they were delivered from central Mexico only two out of 90 we non in the perfect condition. Since they added five pieces extra my mexican tile decorating was completed as intended without any problems. Mexican tiles are unique so is my project. It seamed at the beginning a little bid dark when we have those tiles delivered. Once they ware installed on our kitchen backslash it was clear to us the choice was correct. Dark blue almost cobalt background of this tile is contrasting beautifully with our brown color kitchen cabinets and terra cotta floor. Our tiles were delivered from Mexico and there were a few broken. We were glad Mexican-Tile.net included some extra tiles so we were not short on the project.